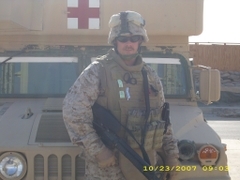 "This is a picture of Patsy FORBES Serna’s son, Troy Charleville, a medical corpsman who is serving in Iraq . [Double click on the photos for a larger view.] She has sent me emails relating how worried she is and how she prays every day for his safe return. How about putting something on the blog for people who have children or grandchildren serving in Iraq or anywhere in the U.S. Military, at home or abroad. We probably have several classmates with close family members in harms way. This would be a way to honor those service personnel and our classmates who wait for their safe return." Just looking at this picture conjures up all sorts of thoughts - from what it must be like for Troy to serve in this way, to what it must be like for Patsy and her family to long for his safe return. 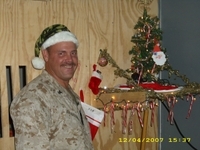 Here's another picture of Troy and the Christmas tree at the military hospital where he is based, "somewhere in Iraq". Suddenly the news reports seem much more real. Certainly this can be a good reminder to all of us to pray for Troy and all others who serve. I would love to post other names and photos of your loved ones. Just send them to me via e-mail and I'll add them to this post. Feel free to give your own thoughts on this topic, either as an accompaniment to the photo you send via e-mail, or through a comment below. Another service member is identified in a comment below. He is Linda Little Strickland's son Keith, who is in the Secret Service (Homeland Security) on the Counter-Terrorist Assault Team (C.A.T.). He is serving on the presidential detail with President Bush at the White House (or as he travels overseas). Please be sure to read her comment for more information. August 1, 2008 - In a comment elsewhere on the blog Donald Hannsz wrote about his son, as follows, "We have a son, Donald...but he's not a "Jr."...different middle names, who is a 3rd Class Engineman in the Navy and is currently stationed at the Naval Shipyard in Portsmouth, VA. He graduated from Clear Lake High School in 2004. He is in a Mobile Maritime Security Squadron (they use 34ft Ridgid Hull Inflatible boats powered with two Cummins Diesel engines with 3-50 cal. machine guns mounted fore and aft) which protect our national assets (such as Naval ships and Naval support vessels) to prevent another USS Cole incident. He will be shipping out shortly for seven months overseas (I'll leave the destination to your imagination...remember..."loose lips sink ships"). Please keep him, his shipmates, and all of our Military Service Personnel everywhere in your prayers." Karla's Note: Here is more information about Keith from Linda's post "The Teacher Who Influenced Me". Third son Keith is with the Secret Service (Homeland Security). The call went out for officers to train for the Counter-Terrorist Assault Team (C.A.T.). Many applied for the training, nine made it and Keith was one of them. At this time he is on the presidential detail with President Bush at the White House. Several things have happened recently to remind me how much I appreciate and respect those in the service of our country (and their loved ones who make a sacrifice too). One of those reminders: the blog comments addressing the years our classmates spent in service - Donald Hannsz, Charles Simmons, John Echoff, Larry Bass, Billy Denning... I am sure there are many more who have served, and I would love to include their names here if you all will tell me who they are. Many of you have seen your children serve as well (the reason this topic was initially posted). Second reminder: the many inspiring video clips that our classmates float back and forth to one another through e-mail attachments. I received one from Larry Bass just this week - very effective reminder of those who serve. Third reminder: I learned just this week that two of the "kids" I taught in second grade (whose moms are colleagues of mine) are now serving in the military. Shane is in training at Camp Pendleton, and Paul has just been deployed to Iraq. I love these kids; they were very special to me then and now. My babies off to war - hard to fathom and a sobering thought. Good morning all and thank you John for your ongoing service to the people of America. You are as one grain of sand that make up the beautiful beaches, one drop of rain that wash our land and fill our lakes and rivers. Only a minute part of the bigger prize that is "AMERICA". Yes we thank you and each of your comrades who allow for the existence of such a "POWERFUL FREEDOM" shared by all who are fortunate enough to be blessed by ownership of the title, "AMERICAN". The pride and title to the right to be honored as a provider of freedom will be echoed through history as a gift to our beliefs. Cherish your service for it has allowed for the continuance of our "AMERICAN DREAM". Continue to be "Always Faithful" my friend.